Fig. 11.5-3. Transverse section of stem of Cordyline (a monocot related to the agaves, no common name). The arrangement of vascular tissues within each bundle of monocots is similar to that in dicot vascular bundles. The protoxylem is not easy to identify here, but it is on the inner side. Whereas dicot bundles often have a cap of primary phloem fibers, vascular bundles of monocots often have a bundle sheath of fibers. 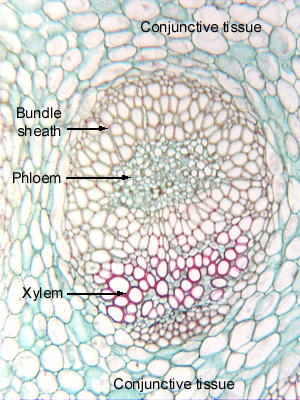 In this case, the sheath surrounds the phloem, and actually isolates the phloem from the xylem; in other species, it ensheathes the xylem also. Notice that these micrographs are oriented such that the phloem is near the top of the view and the xylem is closer toward the bottom. That is merely a standard that has been informally agreed to. In a vertical stem, the phloem would be to the outside – there would be no “top” or “bottom;” it has simply been decided that in photographs, phloem goes on top. In a horizontal branch, rhizome or stolon, a transverse section from the lower half of the stem would have the phloem on the bottom, the xylem on the top, and a micrograph of that could use that orientation if it were important in understanding the biology of the organ.